Hopefully everyone has had a wonderful start to 2019 – I know for us here in Georgia, we finally found that winter weather that eluded us for so long in December! Brides, we hope you were able to join us for the 2019 Behind the Veil Bridal Showcase, February 17th at the Douglasville Conference Center! We had 34 vendors in attendance from numerous categories that provided assistance in all aspects of the wedding planning process. The showcase wrapped up with a fashion show by Simple Elegance Bridal and Formalwear who showed off the latest trends and looks on the runway! In addition to tastings, consultations and the latest trends in décor and ideas. Brides were able to register to win exclusive prizes and giveaways. Whether you were looking for the perfect place to host your wedding or a special spot to dance the night away, we hope the Douglasville Conference Center exceeded your expectations! Showcase vendors included, Proof of the Pudding, Douglasville Conference Center, G&E Studios, Simple Elegance Bridal and Formalwear, Fabulous Indeed Vacations, Paparazzi Jewelry, Club Rett LLC, Celebrate Tuxedos, Nigrelli Photography, HYR Designs, All Occasion DJ, Savvi Formalwear, Halo Special Events and Rentals, Keller Williams Real Estate, Tiffany Dawson Photography, Desserts on Delicious, Wenck Travel, Harmony Travel Getaways LLC and many more! The City of Douglasville will be celebrating its 144th birthday on Monday, February 25th, 2019. To commemorate the occasion, the City of Douglasville invites residents, businesses, and the public to join them at the Douglasville Conference Center at 3 pm on February 25th. ceremony. Pennies will be tossed into the fountain on the plaza to wish the City well in its 144th year. Participants will be urged to make their own wish for the City of Douglasville as their pennies are tossed into the fountain. Additional questions about the event can be directed to Samantha Rosado by calling 678-449-3096 or by visiting the City’s website at http://www.DouglasvilleGA.gov. To celebrate Dr. Seuss’ birthday, in partnership with the Downtown Development Authority, Douglas County Library, Douglasville Convention and Visitors Bureau, and the Cultural Arts Council (CAC), Main Street Douglasville will be unveiling its new Lending Libraries Program in Downtown Douglasville on Friday, March 1. “We are grateful to be able to partner with these amazing organizations and to be able to provide more art in downtown, which falls in line with the Arts Council’s current Public Art Initiative,” stated CAC Executive Director, Emily Lightner. The lending libraries were hand painted by local and renowned artist, Ann Cockerill. She discovered the world of painting at the age of 4 and now owns the Red Cockerill Gallery located in Austell, GA. Ann was commissioned by the State of Georgia to paint Oglethorpe, Jefferson, Washington, and Lafayette’s life-size portraits for the newly remodeled “Old Capital” in Milledgeville. Her painting of Kennesaw Mountain was included in the “Spirit of America Exhibition from Winslow Homer to Andrew Wyeth,” and toured the nation’s museums. Ms. Cockerill was eager to be part of such a great program when given the opportunity. The Lending Libraries program is an effort to inspire a passion for reading and creativity by creating a book-exchange opportunity in the City of Douglasville. Books donated by the Douglas County Library will be available 24/7 for readers to borrow and exchange at their convenience. At 10 a.m., the unveiling event will take place at 6661 Church Street in Downtown Douglasville. There will be a book reading by a special guest, light refreshments and snacks, and a photo opportunity with another special guest! The event is free to attend with attendance by children highly encouraged. RSVPs can be sent to Main Street Manager, Brieana Watts, at wattsb@douglasvillega.gov or by calling 678-449-3198. We think Convention & Visitors Bureaus (CVB) and Destination Marketing Organizations (DMO) are pretty cool, but don’t take our word for it, check it out for yourself, in the image below! Remember, CVB’s are here to help! Whether you’re planning a meeting, event or trip! We make great resources, when it comes to accommodations and local recommendations! The Visit Douglasville Welcome Center temporarily relocates to City Hall, due to construction. In the mean time you can visit us at 6695 Church Street, Douglasville, Ga 30134. The Welcome Center can still be contacted by calling 770-947-5920 or by emailing info@visitdouglasville.com during this time. 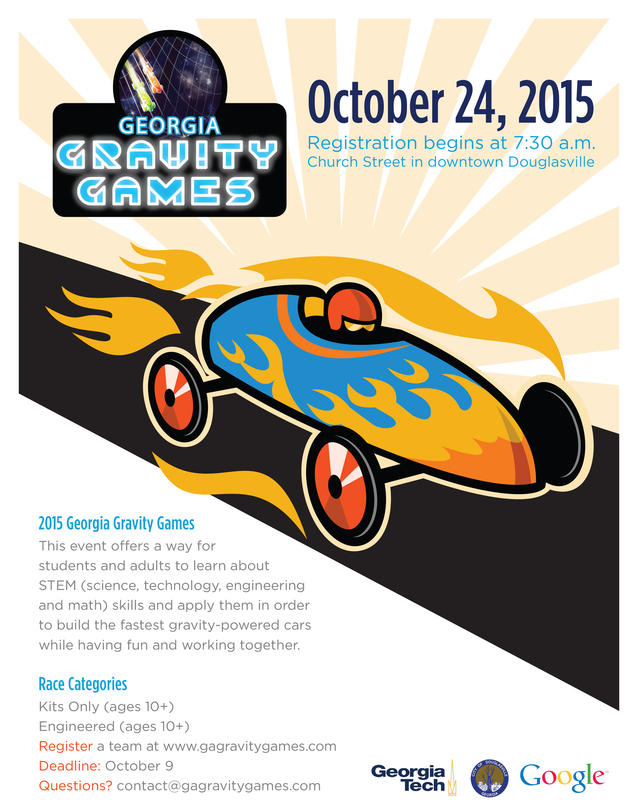 Saturday, October 20th there will be no shortage of activities and events in Douglasville! Kicking off the fun will be the Douglasville Police Departments Community Bicycle Ride beginning at 8 AM at the Public Safety Complex, 2083 Fairburn Road Douglasville, GA 30135. Following the Community Bicycle Ride make sure you stay for the Annual Fall Festival & Safety Expo, from 10 AM – 4 PM! There will be fun for the whole family, with food, crafts, games, k-9 demonstrations, and so much more! 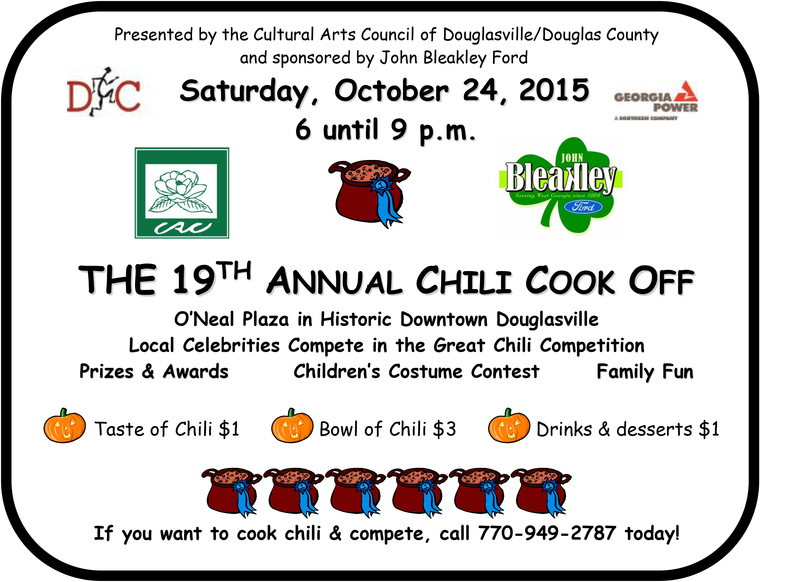 Over on O’Neal Plaza the 22nd Annual Chili Cook Off presented by the Cultural Arts Council of Douglasville | Douglas County kicks off at 6 PM! Cookers from all over the area will have all kinds of tasty chili cooking for all to enjoy! Tickets are $1 each. Make sure to dress in your Halloween best as costume contests will be held for both children and adults, at the end of the night! Wrapping up the day will be the 39th Annual Moonlight Run presented by the Douglas County Rouge Runners! 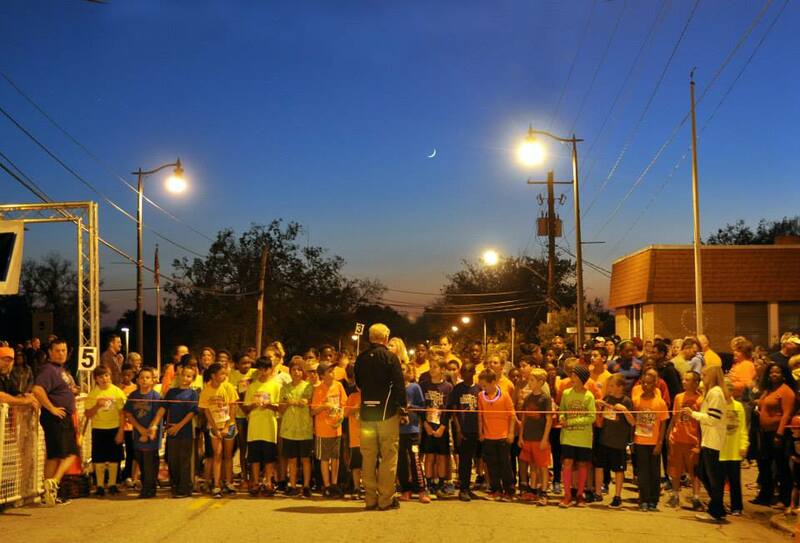 The City of Douglasville Moonlight Run is one of the largest after-dark 5K and one mile runs in the Southeast, with approximately 2,000 participants running through downtown Douglasville. 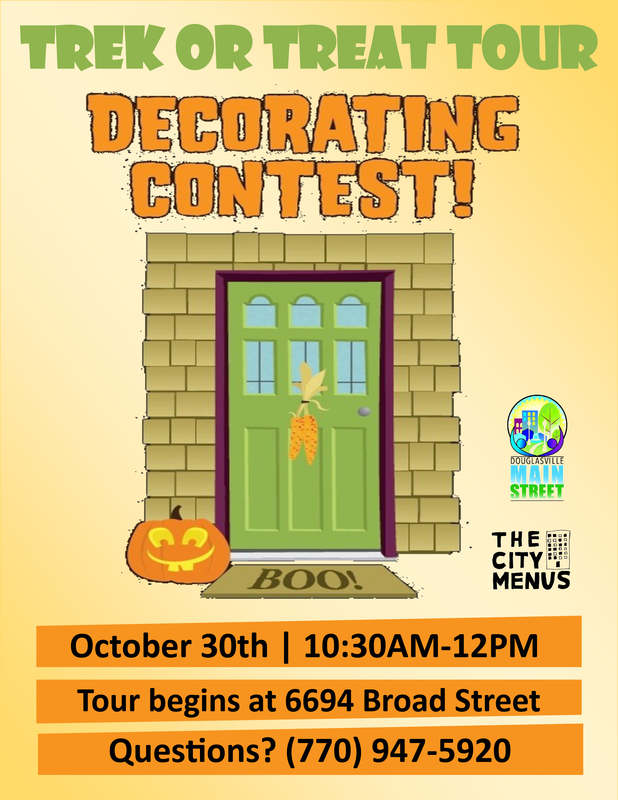 We hope that you will have an opportunity to take part in at least some of the exciting events and activities that are taking place October 20th! 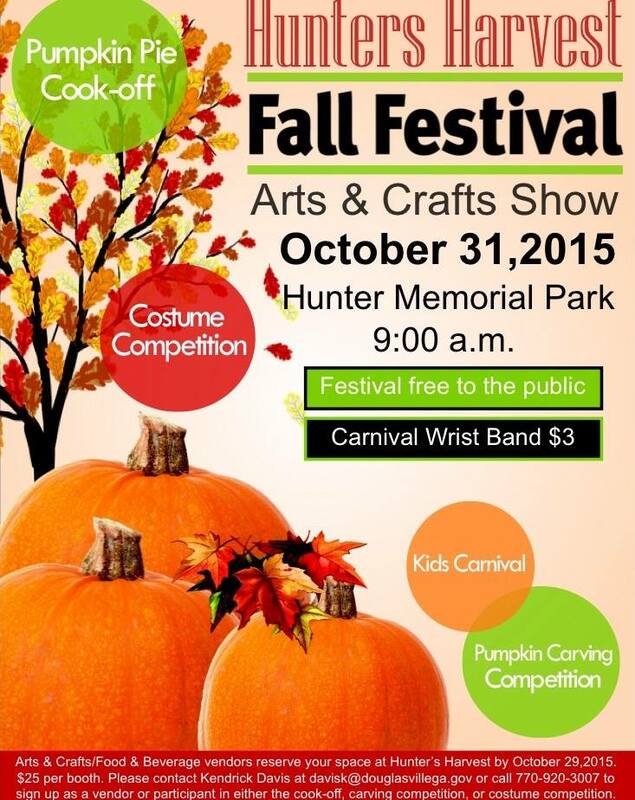 Also make sure to check out Hunters Harvest Fall Festival & Arts and Craft Show next weekend, Saturday, October 27th at Hunter Park, for 12 – 4 PM! The event is free to attend and open to the public. Wristbands for the play zone area are $5.00. Bridal Showcase set for this Sunday! Join the Douglasville Convention & Visitors Bureau, this Sunday, February 18 from 2 – 5 PM at the Douglasville Conference Center to see the latest in bridal trends and ideas! We will have a variety of experts on-hand to answer all your wedding questions and provide you with the information you need to plan your perfect day! Admission is free. To secure your swag bag, pre-register by going to, eventbrite.com. Online registration will close February 12th at midnight. Day of registration will be available. For questions or more information call 678-449-3096. National Travel & Tourism Week (NTTW) is America’s annual week long salute to travel and tourism. It was established by a congressional resolution in 1983. This week of events serves to champion the power of our industry. Travel and tourism professionals from across the nation work throughout the week to promote the impactful contributions their travel markets and organizations make to the U.S. economy. In Celebration of National Travel & Tourism Week the Douglasville CVB & Welcome Center will be hosting an Open House, Friday, May 6, 2016 from 11AM – 3PM. We encourage everyone to come out and meet your local tourism professionals and see the information that is available at the Douglasville Welcome Center. We will also have light refreshments, giveaways & more! For additional information please contact the Douglasville CVB by calling 770-947-5920. 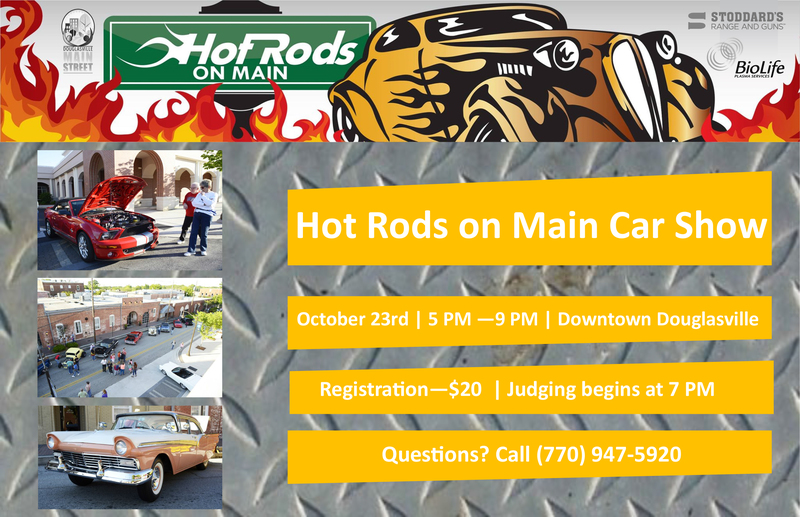 With the weather cooling down, fall events are heating up in downtown Douglasville! Below are some of the great events, that will be taking place over the next few weeks. 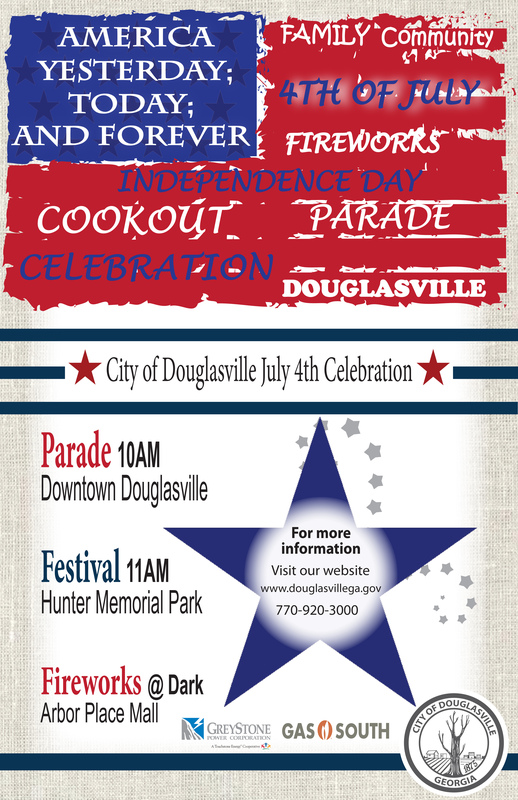 Join the City of Douglasville on Saturday, July 4, for our 4th of July Celebration. This year’s celebration and parade theme is “AMERICA: Yesterday, Today, and Forever.” This is a great family fun event! The annual parade starts at 10 a.m. and makes its way through Downtown Douglasville on Church Street. Afterwards, the public is invited to take part in a festival and barbecue sponsored by S.H.A.R.E House at Hunter Memorial Park. The day will conclude with fireworks sponsored by Gas South and GreyStone Power at dark. The best viewing sites include Arbor Place Mall and surrounding areas. Registration to enter a float into the parade is open now and ends Friday, July 3 at noon. For more information please view our website at http://www.douglasvillega.gov or call 770-920-3000.